1970 DODGE CHALLENGER'R/T' - MID BODY SIDE STRIPE & PLAIN HOOD BLACKOUT DECAL. Large hood decal is die cut for precision fit and does not have R/T logo in decal. Kit does both sides of vehicle. Part # QG-CDCL-70-507- (R/T side stripes). Matt Black (Flat), Black Gloss, White or Red. Matt Black (Flat) or White. Thank you for considering Graphic Express Stripes and Decals. Graphic Express manufactures automotive stripes and decals for Ford Motor Company. And Mopar, Dodge, Plymouth vehicles. 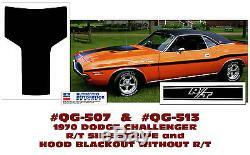 The item "QG-507 & QG-513 1970 DODGE CHALLENGER R/T MID BODY SIDE STRIPE HOOD DECAL" is in sale since Wednesday, March 25, 2015. This item is in the category "eBay Motors\Parts & Accessories\Car & Truck Parts\Decals/Emblems/License Frames\Decals & Stickers\Graphics Decals". The seller is "graphic-express" and is located in Inverness, Florida. This item can be shipped worldwide.